SUBSTITUTE Larry Kingston played a perfect cameo role for Hearts with a dramatic last-minute winner to secure victory over Inverness Caledonian Thistle, who twice came from behind despite finishing the afternoon with ten men. Csaba Laszlo selected the same team which had defeated Kilmarnock the weekend previous apart from Lee Wallace who replaced Jason Thomson at left-back. Inverness, under the command of coach John Docherty, began with a 4-1-4-1 formation in the hope of arresting the recent sequence of seven straight defeats which cost Craig Brewster his job. Docherty included future Hearts midfielder Ian Black amongst an experienced group of substitutes. An untidy opening period ensued until Hearts sprung into attack on 21 minutes. Bruno Aguiar released Andy Driver with an intelligent through ball behind the visiting defence, and the winger’s cross would have produced an own goal off the sliding Grant Munro had it not been for Ryan Esson’s sprightly reactions. The hosts somehow avoided falling behind five minutes later, however, as Dougie Imrie contrived to head Don Cowie’s free-kick into the side netting when unmarked at the far post. For each sigh of relief heaved in Laszlo’s technical area at that point, there must have been a groan of despair from those in the away dugout after wasting such a glaring opening. The match continued in a turgid fashion until Hearts’ opener broke the monotony. From Driver’s hanging cross, David Obua rose with Esson to win the ball in the air and knock it into an empty net for his first goal in maroon. The delight on the Ugandan’s face betrayed the difficulties he had endured adapting to Scottish football. Driver’s powerful strike brought a vital save from Esson at the start of the second half, however Hearts’ one-goal advantage always looked fragile and on 56 minutes Inverness forced an equaliser when Pavels Mihadjuks headed Cowie’s free-kick venomously beyond Jamie MacDonald. Moments later, and with the home defence caught unaware, Cowie accepted a short corner and crossed for Ross Tokely to send what was a decent chance into the Roseburn Stand. Inverness were beginning to sense the prospect of a second goal with Hearts restricted to playing in their own half. 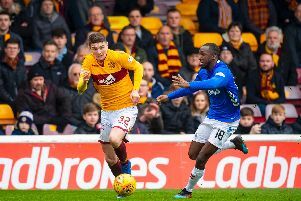 Christian Nade enjoyed an impressive overall performance in the lone striking berth and Esson was required to stop shots from both the Frenchman and midfielder Michael Stewart in quick succession. The need for a goal brought Gary Glen off the substitutes’ bench on 64 minutes much to the chagrin of Aguiar, who was withdrawn and headed straight for the home dressing-room in disgust. The afternoon erupted in controversy just before the hour. Driver was taken down in the penalty area by Roy McBain, who was then booked for protesting after referee Steve Conroy awarded a spot-kick. Stewart’s strike from 12 yards was saved by Esson before McBain received a straight red card for an off-the-ball incident having remonstrated with one of Conroy’s assistants. Esson tipped a Christos Karipidis header on to the crossbar as Hearts, intending to capitalise on their one-man advantage, began to press forward. Driver and Obua had swapped flanks and soon repeated their combination for the first goal to restore the hosts’ advantage. Driver’s right-sided cross was met by the towering Obua at the back post, and this time his header flew past Esson and into the goal. Cue yet more jubilant Jambo celebrations. However, Imrie struck a free-kick as sublime as any seen at Tynecastle and Inverness must have thought they would be taking a point back to the Highlands. But they hadn’t reckoned on Kingston’s late contribution - the Ghanian, who entered as a substitute for Nade with four minutes remaining, converted Driver’s cross. Hearts: MacDonald, Neilson, Jonsson, Berra, Wallace, Obua, Stewart, Karipidis, Driver, Aguiar (Glen 64), Nade (Kingston 86). Subs not used: Cesnauskis, Kello, R McGowan, Thomson, Mrowiec. Inverness CT: Esson, Gathuessi (Proctor 18), Munro, Mihadjuks, Tokely, McBain, Duncan, Cowie, Imrie, Wood (Rooney 86), Vigurs (McGuire 76). Subs not used: Fraser, Black, Gillespie, Barrowman.